Soak the raisins in rum. Put the flour, along with a pinch of salt, on the work surface. Create a trough in the flour and pour in the oil and the water. Use your hands to knead into a pliable dough. Now, place the dough in a bowl, cover with a kitchen towel, and leave it to rest in a warm place for approx. 25 – 30 min. Preheat the oven to 180°C/ 350°F. Then, peel and core the apples, halve them lengthwise, and cut them into thin slices. Mix apple slices, almond slices, vanilla sugar, soaked raisins, and gingerbread spice together in a bowl. Place the dough on a kitchen towel dusted with flour and, using the rolling pin, roll it out as much as possible. Then, use your hands to carefully pull out the dough, until it is paper thin. 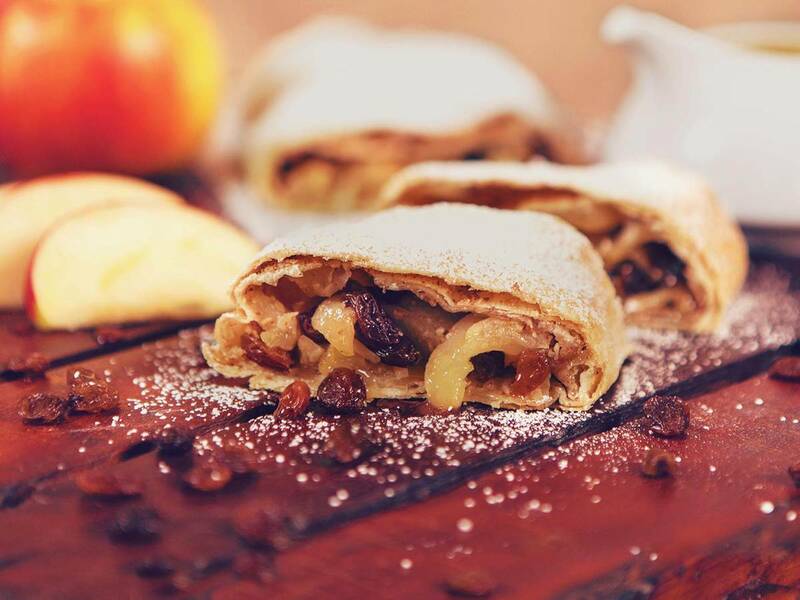 Distribute the ground almonds evenly onto the strudel dough. Then, place the apple mixture onto the bottom part of the strudel. Using the kitchen towel, carefully fold the dough around the apple mixture. After every fold, brush with melted butter. Repeat this process until the whole strudel is unrolled. Cut the excess dough away from the edges. Make sure the joint is facing down and then use the kitchen towel to place into a suitably sized baking tin . Baste the top with melted butter, place immediately into a preheated oven at 180°C/ 350°F, and bake for approx. 20 – 25 min. until golden. Dust with confectioner's sugar and serve with vanilla sauce.